What is a Dutch or Flemish gable? 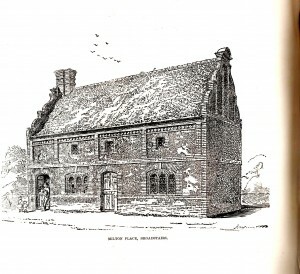 A feature on a number of houses in Thanet and Kent, particularly in the east of the county dating mainly to the 17th and 18th century. After sixteen and a half years in estate agency locally I knew a number of these houses with curvilinear gables, but after being asked to date the house of a friend I realised I didn’t know a great deal. The general thought is that they were built by protestant immigrants from the then catholic Spanish Netherlands, but this soon turned out to be too simplistic an answer. It transpired that immigrants from across the North Sea have been coming to England since the 12th century at least and 60,000 came during World War II. (A house in Dumpton Park Drive, Ramsgate, has a white brick in the garden wall with the words “A. Mynheer Builder 1947). Until the arrival of the railways in the mid 19th century, Thanet was mainly an agricultural ‘island’ with a flourishing side line in smuggling from and to the three small ports of Ramsgate, Margate and Broadstairs, and any convenient beach. The arrival of the railways at the beginning of Queen Victoria’s reign transformed the ports into seaside resorts and sparked a building boom which no doubt destroyed many of the older buildings. Having occasionally been called to market a pre- Victorian house I developed the idea that in retirement I would note all the pre-Victorian farmhouses, cottages and houses that survived the arrival of the railways. After spending summer holidays from school in a 15th century moated farmhouse in Hertfordshire and then working on a Welsh hill farm at 16 years of age it is perhaps not surprising that the author has affection for old properties. The Japanese have a word ‘shibooee’, meaning roughly ‘the grace of olden things’, and that is how I feel about the Dutch and Flemish gables and brickwork (the arrival of which roughly coincided with the style) in particular. To start with I chose a member’s house in Northwood and noticed (not obvious from the road) that it had an interesting side gable. As well as the brickwork having curving lines, there was a large ‘M’ in flint and a number of bricked up windows. Intrigued I asked the owners if they knew the age of the building and what the ‘M’ stood for. They thought it was 17th century and suggested an old Thanet name of Maxted. I offered to ascertain the date and realised that here was an example of a Dutch or Flemish gable that I could study in detail. I noted that the gable had a segmental pediment, a string course in the bricks, ogee curves to the sides and flint lower down in the walls as well as in the ‘M’. That was in 2007. 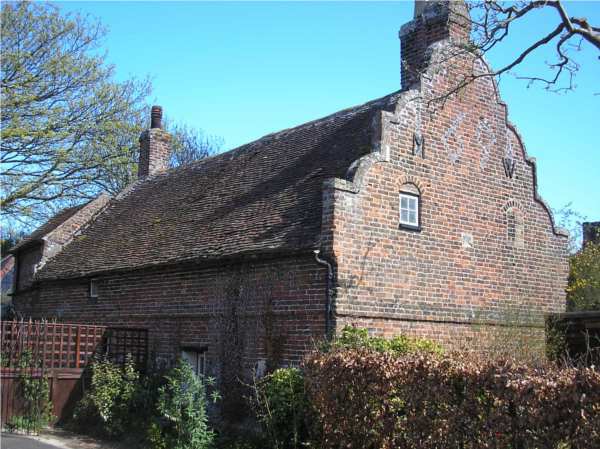 Thus started a project that is ongoing and includes all of Kent and East Anglia and less intensively the whole country as it transpired that no one has studied Dutch gables nationally and some noted architectural authors stated that such a study was needed. The bricked up windows were found to be a common feature for examples built before the introduction of the Window Tax in 1696 (repealed in 1851) and helped in dating. Many of the original looking dormer windows were inserted on repeal of the ‘daylight robbery’ tax. Although gables are more common in eastern counties they are found countrywide, especially in the fashionable larger house. I was soon hooked into the building style and then the history of the period, to find out if the popular reason for these Netherlandish gables, i.e. protestant refugees from catholic oppression in the Spanish controlled Netherlands was valid, to discover dates, and any distinguishing features apart from the curvilinear gables. An offshoot of this study was to discover the ‘history’ of bricks and the bonds used to bind them as the arrival of the gable fashion coincided with the increasing cheapness and thus use of bricks, although flint, being freely available from nearby beaches, was used commonly in Thanet. The date being important, we are fortunate that in Thanet, six out of the fifty eight examples have the date build in to a wall which gives a starting point. Three others have two numbers that may give part of the date. 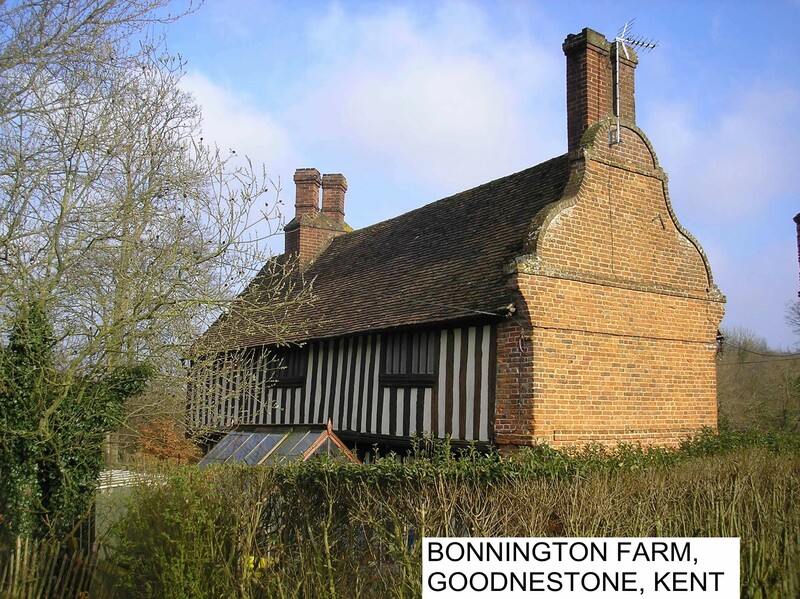 Two fairly definite dates can tentatively give the start and end of the main period of building in Kent before they went out of fashion – the reason for their popularity. In Cornwall, a house with these gables dates to 1571, the oldest surviving securely dated house. 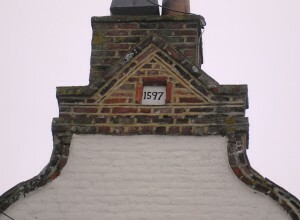 The former White Horse pub in Minster is dated as 1597 high up in the gable (but it has been refaced in brick more recently) and 40 on a house in Ramsgate High Street is almost certainly 1740 as it is in the Queen Anne style (and Cottington Court Farm at Deal has a panel giving the date of 1741) which is close to the end, before a revival of the fashion came in roughly coinciding with Queen Victoria’s reign a hundred years later. There is a single example in Wiltshire dated to 1814 that falls outside the normal fashion range. One can still see the odd new building with a copy of the style as at London Road Ramsgate built since 2000 and designed by Malcolm Rowlett and built by Bill Willsmer of St Crispin builders. 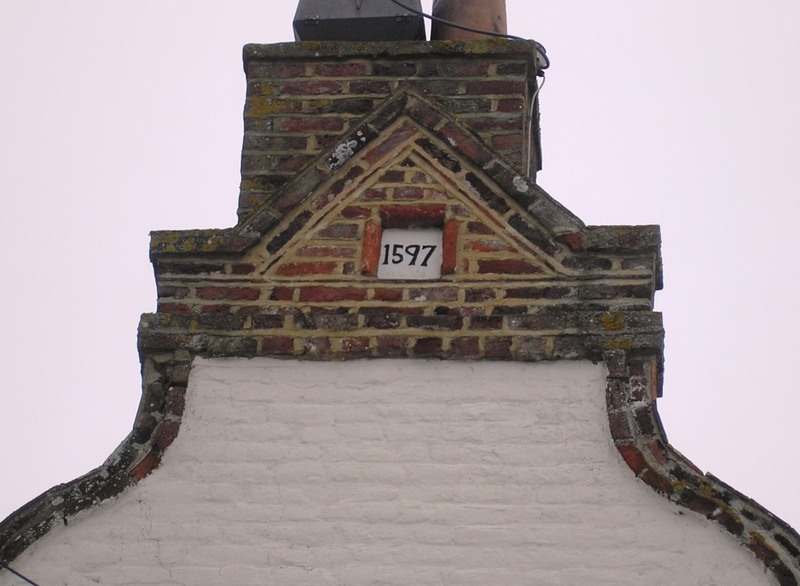 The difference between the 1597 and 1740 houses satisfied one of the aims of the study – to note changing style with time and/or area as is found with Roman mosaics, emphasising once again that the gables were often a result of fashion. In Norfolk (click here for examples) and Suffolk the shapes are similar to Kent but in Essex they are different with often a pointed top. Thanet has a pediment style only found on the former island and the adjoining mainland which could be described as an open pediment reversed as on the Minster property above. In East Anglia there are styles not found in Kent although the most common pediment in Kent, i.e. a round or segmental pediment, is also the most common in East Anglia. 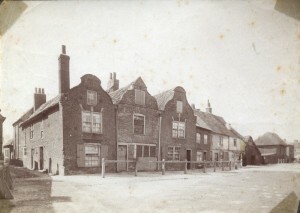 On Lamb’s Cottage, (above right), one can still see wall anchors with the letters ‘M’ and ‘W’. At present I don’t know what they stand for. One good suggestion was Mary and William as the date is just two years after William and Mary’s accession to the throne even though I think this unlikely because on other houses with a date plate with initials they seem to note the first residents/owners and possibly the builder. The demolished (in 1910) Milton Place in Broadstairs having ‘C’ for Culmer the builder over ‘D’ ♥ ‘S’ presumably the loving first owners and the date of 1673. The drawing (right) appeared in the 1878 edition of Archaeologia Cantiana the year book of the Kent Archaeological Society, (reproduced with permission). St Peters Farmhouse has the initials of the first owners only. 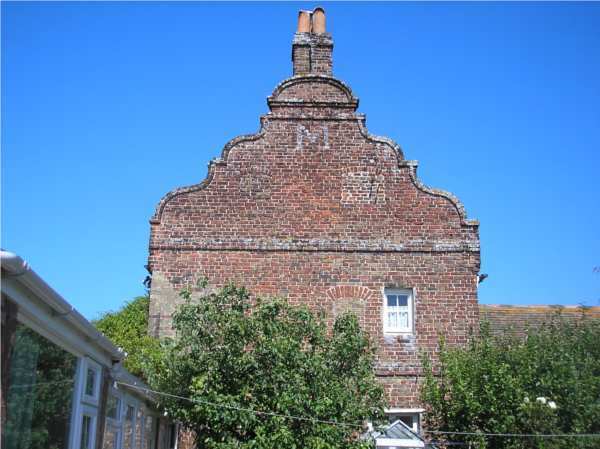 A Richard Mockett bought the farmhouse in 1657 and 25 years later had the porch build, the inbuilt stone tablet recording ‘M’ over ‘S’ ‘R’ and 1682: Mockett over Sarah and Richard. In 1710 the house was re-fronted to keep up with fashion and MOCKETT Isaac and Elizabeth was recorded in stone. Outside of Thanet and Deal, half of the Dutch gables, all of which are built of brick, are attached to older timber framed buildings, indicating fashion being the reason for this style as at Bonnington Farm above. Another result of the investigation was the discovery of the number of Dutch gabled houses that have been lost. 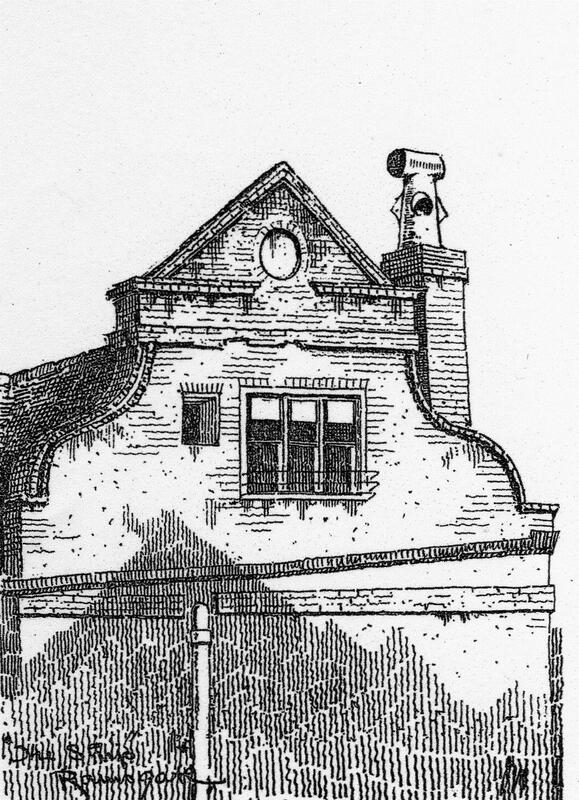 The picture on the left is a drawing by James Weir done in 1881 of the Ship Inn in Ramsgate, one of a number of pubs with Dutch gables now demolished. The existence of others can be guessed at where the building has been altered by ‘shaving’ the curves to simplify repairs – a likely candidate being a building in Crow Hill Road, Broadstairs or Letterbox Cottage in Sandwich. Others no doubt await detection, but so far there are definitely 28 that have been lost in Thanet and possibly 38 in Deal alone, (the latter mostly due to World War II bombing). Nationally, the total must exceed 100 lost vernacular houses and at least 17 major houses, the latter mostly due to fire and bankruptcy. 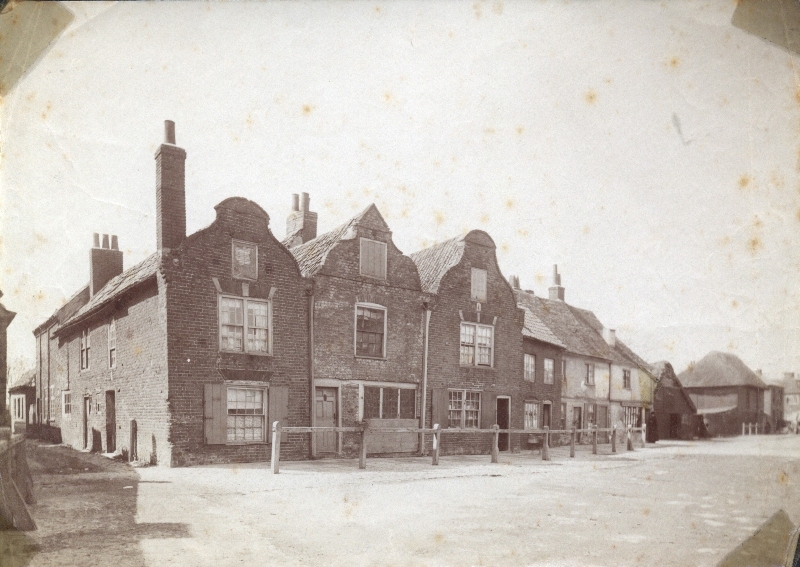 Photo left by William Boyer circa 1880, is courtesy of Sandwich Guildhall Collection © of three that once faced the defunct cattle market in Sandwich. To return to the beginning, the house in Northwood was originally a farmhouse and was saved from demolition by the present owners when the farm buildings were demolished to make way for bungalows. 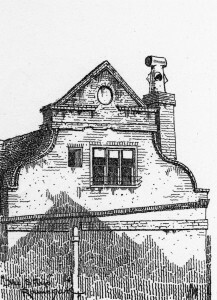 The date has been tentatively put at 1668 as ’68’ in iron is on the front wall of the extended (in the distant past) building and the figures are in the style of the 17th century and may have come from the north gable rebuilt after a fire. The study is ongoing nationally, but coverage and analysis of Thanet’s examples both surviving and lost is complete and is now available in a beautifully illustrated booklet, with a guided tour of all 58, for £9.99 + £2 postage and packing. If you wish to buy a copy, please email your request to mail@iotas.org.uk and we will pass enquiries on to the author, Gordon Taylor. Also available from The Art Gallery in York Street Ramsgate for £9.99.